This is our custom-built 5 pin XLRF to 5 pin XLRF DMX-512 110ohm digital lighting control cable turnaround with two pair wire (All 5 pins wired). Construction is Neutrik XLRs with Horizon DMX2 cable. Neutrik connectors are some of the best connectors around, with no screws to fall out after years of abuse. 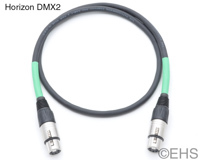 Horizon DMX2 cable is very flexible, durable, light-weight cable, with 24awg twisted pair core and 100% coverage foil shield with drain. Photo 1 shows 3' cable with green shrink. Photo 2 shows the two ends with nickel connectors and with green shrink.